Our lifestyle and running around 24/7 is a huge cause of stress. Most of us step out on weekends for a short drive and quick bite. Travelling within the Delhi & NCR region is quite hectic and highways always beckon. Breaking routine is very important to feel alive and reduce stress. Weekends at home usually boil down to managing household chores and laundry for most of us and we all tend to make excuses to step out keeping in mind the rush on roads and long waiting queues for eating outside. A simple stress free drive with family allow us to spend quality time and enjoy the day. One of the favorable weekend getaways is AGRA. From the new expressway, Agra takes around 2 hours 20 minutes from Delhi and is an interesting place to spend time. We travel to Agra quite often and usually spend our weekends at the Courtyard by Marriott. The staff and management at the Courtyard is above and beyond from a service standpoint to such an extent that it is relaxing and enjoyable every time we visit. 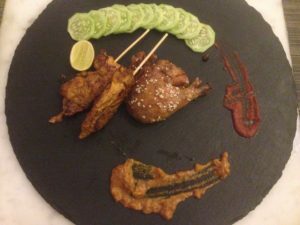 Courtyard by Marriott is an amazing place to plan a lunch since it has some nice options and they my surprise you with some innovative dish on request. The Head Chef, Mr Kalia has been there for a long time now and we are always thankful to him for succulent meals prepared by his team. One of the highlights of the dining area in their restaurant is a separate play area for kids which is great for young parents trying to enjoy a good meal without bothering about engaging their children. the lot. ITC also has some great preparations and can surprise you. You could also visit Radisson Blu and some other fantastic properties. One of the benefits of travelling to Agra is the expressway that allow you to enjoy your drive without bothering too much about traffic (only if you are careful). Plus if you have missed the magnificent symbol of love “Taj Mahal” than it could be a perfect destination for a romantic weekend getaway. Expressway till Agra is a toll road (toll amount – INR 420). In case you don’t plan to visit Agra and prefer a short drive than you could just hit the toll booth and take a u-turn. Drive till Agra can be more fun if it is drizzling, the terrain is stunning at times. It sounds like you all had a great time making a quick highway drive to Delhi. I do believe it is important to a family to get away for a day on a drive or to go see something no one has seen before. It really do revive you. Thanks for sharing your awesome family experience. Wow this is neat! I love that the hotel had a play area for kids. Sounds like a great place to get and enjoy! It is so important to experience where you are at. I know the feeling. Adjusting to changes can be tough. Here in South FL the speed limit on the highway is 70, sometimes 80. In North Jersey is was way less. I’d love to indulge in a Marriot hotel! I’ve stayed in their hotels in the past and they are wonderful! Leaving in a different country or even city always bring its challenges. I am glad you are getting around! I have always wanted to go explore Delhi. I would love to try the food at the Courtyard by Marriott. It is nice you are only a short drive away. I think it’s so great to hit the road and just enjoy time with the family. The Courtyard sounds like a great place to stay! That fountain in the hotel is beautiful. I like that they have a play area for kids.